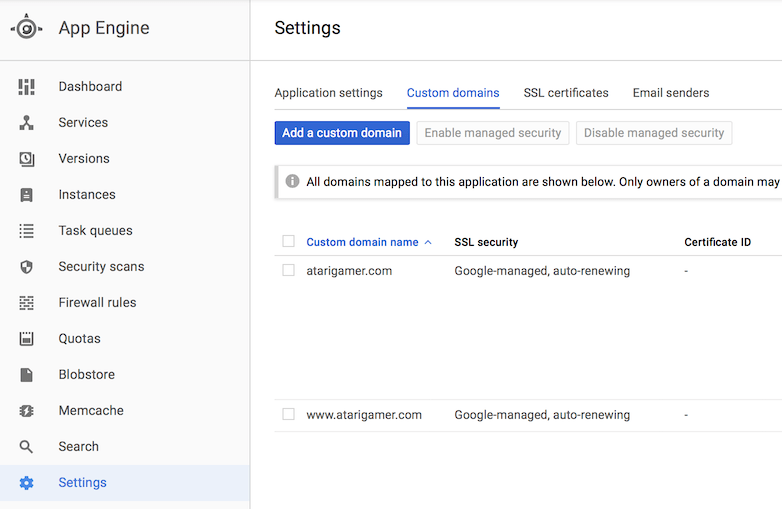 While trying to enable managed security in the App Engine Settings > Custom domains for my new project, AtariGamer.com I ran into an issue with DNS. App Engine kept on displaying the yellow exclamation symbol with the error - "DNS records could not be found. Certificate activation will retry automatically". I tried to reach out to Google and they were entirely not helpful in resolving this issue so I started digging around myself. After much searching I worked out that the issue was due to CNAME Flattening that CloudFlare implemented! Back story: In my usual fashion I put the website on CloudFlare as soon as I could, as I've written previously here - How to securely host your web site for free with Google Cloud and CloudFlare. That article doesn't really apply now that Google is providing free SSL certificates to all App Engine projects, but it's still nice to have for load balancing and availability. 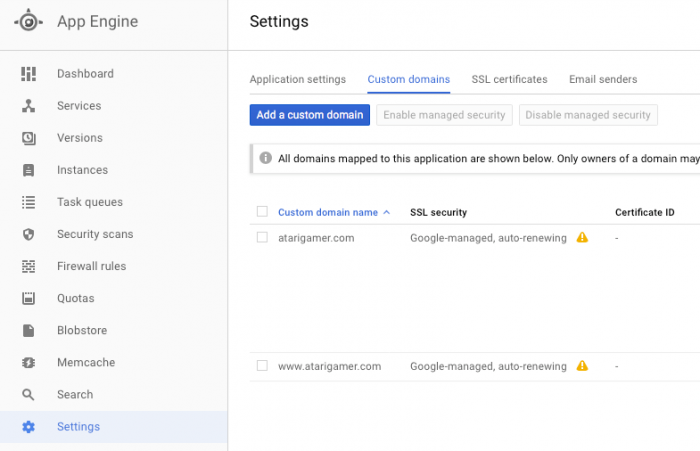 The key to enabling managed security in App Engine is that CNAME record of course. I tried setting it to bypass the CF network, but that had no effect. I had to temporarily take my site off CloudFlare. This meant changing the name server records at my domain's registra. 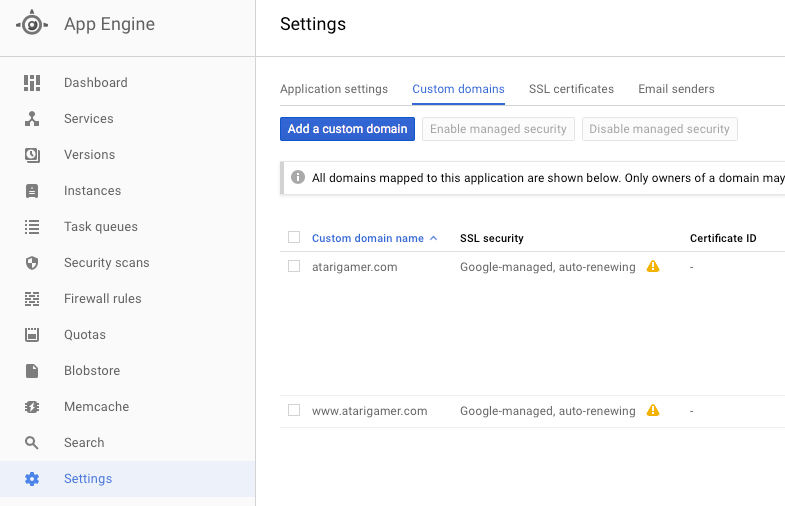 After changing name servers to my registra's standard name servers I added all of the required A, AAAA and CNAME entries that Google expects, waited the required TTL and then enabled managed security again. It worked like a charm straight away (ok it took maybe 5 minutes to activate)! For some reason the certificate IDs did not show up in the UI however but there was a way to get them, more on that later. After that I changed the name servers back to CloudFlare and enabled Full security in the Crypto tab. It kept on working and I confirmed that the site was being served from CloudFlare. I expect this should stick, unless Google decides to revalidate DNS records during SSL renew.